STONE ROSES "SHE BANGS THE DRUM" LYRIC PIN BADGE. METAL/ENAMEL TOPPED. FASTENS BACKSIDE WITH BUTTERFLY CLIP. BRAND NEW. 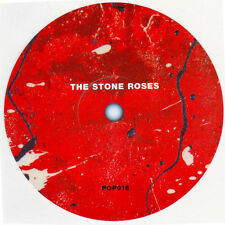 Reproduction of classic Stone Roses 1st album record label. The label is waterproof; printed onto polypropylene with a mat laminate finish. Strong adhesive backing, so can be stuck anywhere: wall decoration; guitar case, laptop, on the side of a speaker etc. Reproduction of classic Stone Roses record label. 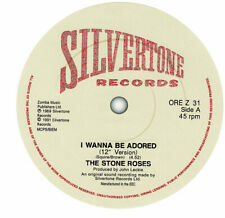 "I Wanna Be Adored" released in 1991 on Silvertone Records. Strong adhesive backing, so can be stuck anywhere: wall decoration; guitar case, laptop, on the side of a speaker etc. The photographs don't do justice to the coasters. The print quality is razor sharp - amazing when you consider that the printing is done directly on to a plastic, therefore waterproof label. Fools Gold. 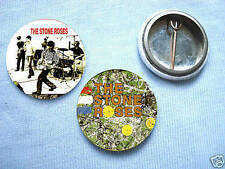 Stone Roses Pin Badge . Condition is New. Dispatched with Royal Mail 2nd Class Large Letter. LOVELY ARTWORK AND IN GREAT CONDITION FOR IT'S AGE. A set of 8 Stone Roses guitar picks. These are 0.71mm medium gauge plectrums. The front has a full colour image. The rear is blank, plain white. Premium quality. Picks are the same size as standard Fender / Gibson guitar picks. The Stone Roses Homemade Birthday/Greeting Card. Condition is New. We are not a company, these cards are homemade to the best of our ability. They are blank on the inside and the back for a personalised message. They also come with an envelope.Dispatched with Royal Mail 2nd Class Large Letter. the stone roses Made of Stone 12” Single (very Good Condition). The Stone Roses - Made of Stone 12” Single ORET2 1990 Side One - Made of Stone Side Two - Going Down / Guernica This is a 1990 Re-issue as the catalogue number is in pale blue on the back. Had from new and hardly ever played. Sleeve is in very good condition. Vinyl has been cleaned and sounds very good apart from the odd crackly noise for 29 years old. MOUNTED DISCOGRAPHY POSTER PICTURE MOUNTED ON HIGH QUALITY CARD BEHIND A BLACK BEVEL CUT MOUNT. EACH PICTURE CONTAINS 9 POSTERS THAT ARE 8cm by 6 cm each OVERALL SIZE 14” BY 11” THIS PICTURE IS READY TO FRAME AND WILL LOOK SUPERB ON ANY WALL. THIS ITEM IS 100% UNOFFICIAL! I EXCEPT PAYPAL AND POSTAL ORDERS (UK ONLY) ALL ITEMS ARE TYPICALLY DISPATCHED WITHIN 48 HOURS OF PAYMENT. I OFFER A FULL REFUND IF YOU ARE NOT HAPPY WITH YOUR PURCHASE SO PLEASE LOOK AT MY FEEDBACK AND BUY WITH CONFIDENCE. IF YOU ARE LOOKING FOR A PARTICULAR BAND OR ARTIST PLEASE FEEL FREE TO CONTACT ME PLEASE CHECK OUT MY OTHER ITEMS AND THANK YOU FOR LOOKING! THIS IS A ROUND 100MM STICKER APPROX 4" AS SEEN ABOVE. THE STONE ROSES SECOND COMING. QUALITY VINYL MATT STICKER WATERPROOF. Spike Island DVD Launch Badge / Flash Drive Bundle. Obtained at the Spike Island DVD launch at Band On The Wall, Manchester, England. 8 Badges in total with 1 X 1GB (empty of data) flash drive. Fantastic stone roses made of stone coaster. 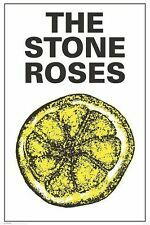 STONE ROSES. Presented image on disc. The background image consists of a record player. A Rhinestone has been placed into the middle of the customised Record label for added flare! 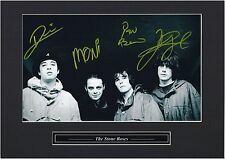 Stone Roses Original Autographs Ian Brown Reni John Squire. Signed by 3 of the band in blue biro on a divider sheet from a book I was carrying - that was all I had to hand at the time! Obtained in person at Milan Malprnsa airport in 2012. All guys were absolute gents. Having a clear out and trying to raise funds for our new arrival! Condition is Very Good. Dispatched with Royal Mail 2nd Class Large Letter. All 4 Fanzines are in excellent condition, as are the Newspapers & Magazines. Stone Roses Casette Album - Import that includes Fools Gold. (Cover not included). I Wanna Be Adored/Where Angels Play 7" Vinyl. 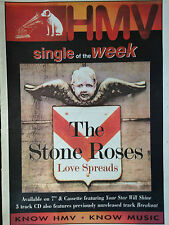 THE STONE ROSES - Love Spreads. for the single release Love Spreads - with release date: 21.11.94. on junction boxes at traffic lights as advertising - the paper quality is not. Still factory sealed in long box. 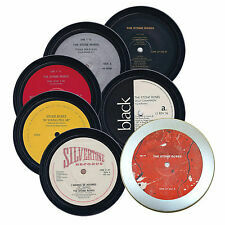 This was the Silvertone UK file copy and has sticker - Silvertone Master file Do not remove. CDs mint unplayed, box EXC. 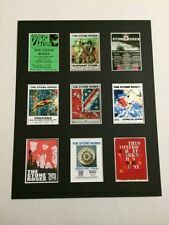 Original Stone Roses concert ticket Brixton Academy, London 9th December 1995 VGC. Condition is Very Good. 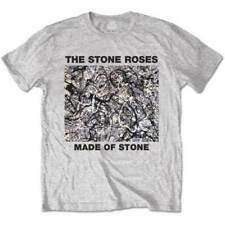 Stone Roses Lyrics T Shirt - SHE BANGS THE DRUMS. 18 Colours. All Sizes. 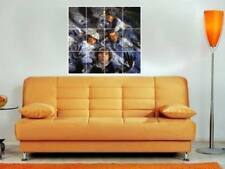 A stunning and collectable new art print inspired by the superb 1989 self titled debut album `The Stone Roses`. Title : "The Stone Roses". Limited edition art print of 295 signed by the designer/artist who created the art print and not the band/artist featured in the design. THE STONE ROSES THE OBSERVER SONGBOOK. PUBLISHED 18 MAY 2008. The Stone Roses, and Primal Scream, Hampden Park Glasgow Scotland. The 4005 is a hollow-bodied bass and one of the first series of bass guitars produced by Rickenbacker and discontinued in 1984. Whilst recording their first album The Stone Roses, Mani had his 4005 customised in this Jackson Pollock - influenced style by fellow guitarist John Squire. Ian Brown,Stone Roses - Original Art for BBC2 TV - I'm in a Rock 'n' Roll Band! Artwork was produced for the BBC TV Series "I'm in a Rock 'n' Roll Band!". Item is in excellent condition.